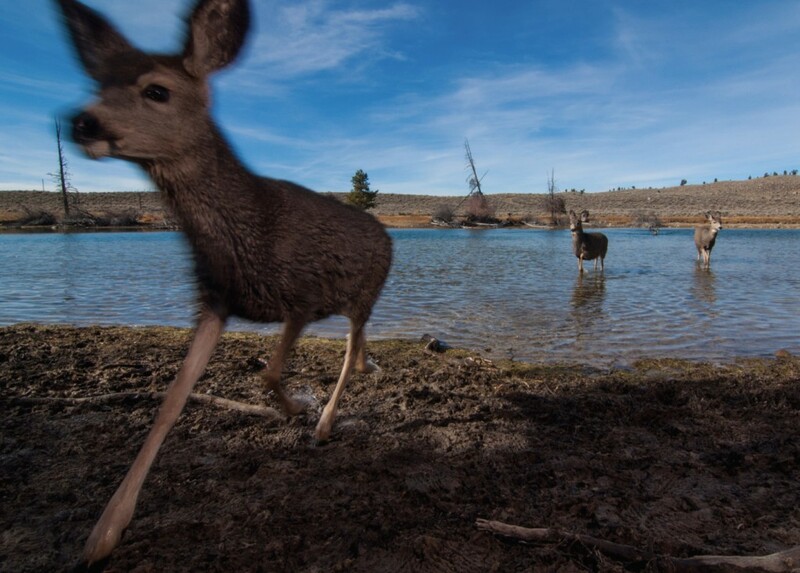 Each spring, just outside the town of Pinedale, Wyoming, some 5,000 mule deer slip through a 400-meter-wide gap between a housing development and Fremont Lake. The deer pick their way past paved trails, Forest Service roads, a marina, and surprisingly, a Frisbee-golf course. They swim the lake or cross below at the outlet, then search for gaps in an eight-foot tall woven wire fence that’s meant to funnel elk away from private lands but also catches deer until they figure out a way through. Scattered homes nearby create a gauntlet of yards, dogs, and paved roads. In the fall, the deer repeat the journey in reverse, and fawns learn the complicated route for the first time. Mule deer cross the outlet of Fremont Lake near Pinedale, Wyoming. Photo by Joe Riis. Biologists with the Wyoming Migration Initiative ranked Fremont Lake, a tight spot in the 150-mile Red Desert to Hoback mule deer migration, first on a list of threats to the corridor that deer have probably traveled for millennia. It’s also a perfect place for houses. With open space on one side and town on the other, it offers views straight into the Wind River Range and easy access to city services like water and power. It is ideal for a developer targeting home buyers who want vistas and the convenience of a grocery store nearby. It was only a matter of time before this little chunk of private property would start to grow homes. The Fremont Lake story is playing out in beautiful places across the West. Cabins and homesteads have long dotted the landscape, but the pace and breadth of population growth in the spaces between towns is something new. The Center for American Progress estimates that between 2001 and 2011, nearly 4,300 square miles of open lands were lost to development in the western US. Wyoming led eleven western states with the greatest loss of natural areas to development, at nearly five percent. West-wide, three-quarters of that loss happened on private lands, and in sparsely populated Wyoming, much of that is attributable to growth in second homes. Rural residential development is eating away at open spaces and the wildlife populations that depend on them. Whether to conserve agriculture or wildlife or both, land trusts are working to intervene. Using maps and models, they prioritize properties for conservation. But with booming residential development, predicting what will be lost is the first step in planning what to save. To rightly guess where the next subdivision will pop up in prime habitat, land trusts have to think like realtors. Conservation dollars are limited, and voluntary conservation easements or outright land purchases can be expensive—millions of dollars even. To make conservation purchases efficient, land trusts might optimize conservation benefit and financial costs—maximizing one, reducing the other. But what about risk of development? 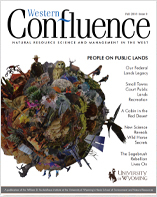 University of Wyoming researcher Benjamin Rashford and agricultural economics master’s student Abigail Scott developed an approach that adds a third dimension for land trusts to consider when they evaluate prospective conservation purchases: in addition to financial cost and conservation benefit, they quantified properties’ development potential. Whether a property is developed depends on the financial situation and motivations of the property owner, which aren’t always knowable. But it also depends on the property itself. The researchers determined that people are more likely to buy and develop properties close to town, roads, and recreational areas; without steep slopes; and with great views. 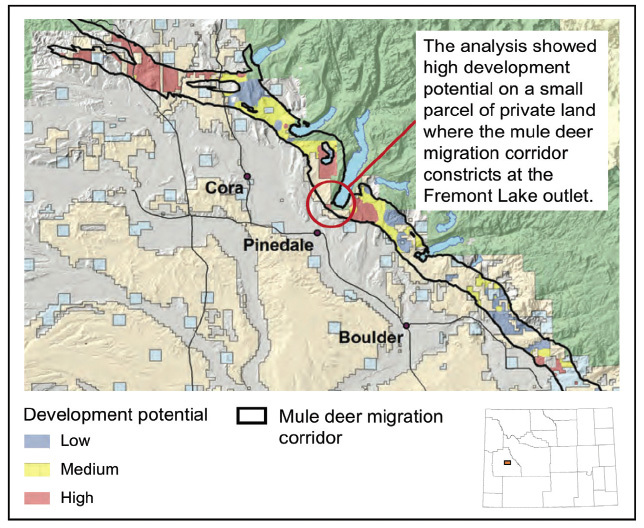 When they analyzed these factors along the Red Desert to Hoback mule deer migration route, the Fremont Lake property popped out as one of the highest risks in terms of development potential. That lined up perfectly with the Wyoming Migration Initiative’s assessment of threats to the migration. It sounds intuitive, but unless conservation buyers explicitly consider development potential in decision making, they can make a wrong move. A land trust that considers only dollars and ecological benefit (such as acres of mule deer migration habitat) could justifiably prioritize the property with the greatest ecological benefit and the lowest cost—say, a big ranch 50 miles from town that sits in the mule deer migration corridor. But factor in development risk, and a different property comes to the forefront, in this case the small but vulnerable Fremont Lake bottleneck, which ticks all the boxes on Rashford’s development threat list. A land trust could probably buy multiple conservation easements for the cost of this one small parcel. But with development potential in the mix, the calculus around conservation purchases starts to shift. Think of it this way: If the big-but-distant ranch has very little risk of being developed, spending money to keep it open won’t change the future for the deer. And using limited resources to protect that land will eat into funds the conservation buyer could put toward the Fremont Lake property when it suddenly (and very likely according to its development potential) comes on the market. In fact, the private land spanning the Fremont Lake outlet did go up for sale in late 2014. Because of its tremendous potential as home sites, the 364-acre property was listed for the hefty price tag of $2.1 million. Whoever would purchase the property would seal the fate of the Fremont Lake bottleneck and its traveling mule deer. Conservation easements are one way to protect the private lands that help safeguard migration corridors. County land use planning could also help by nudging residential development to less sensitive areas. At least in a few places, new GPS collar studies have yielded maps of corridors with known widths and lengths, well-suited for land use planning overlays. But even with great information, the risk of rural residential development in crucial wildlife habitat remains high in Wyoming. Sometimes counties must prioritize other needs over wildlife. Other times, high-priority wildlife habitat turns into a patchwork of ranchettes in spite of planning. The Fremont Lake property was at risk of development in two ways. The Sublette County comprehensive plan identifies the Fremont Lake property as zoned for agriculture. A developer could have requested a change to residential zoning to allow a neighborhood of homes, streets, and power lines. That would have triggered a review by the Wyoming Game and Fish Department, which increasingly considers big game migrations in their recommendations. “I always give a lot of weight to Wyoming Game and Fish Department recommendations,” says Bart Myers, Sublette County Planner. 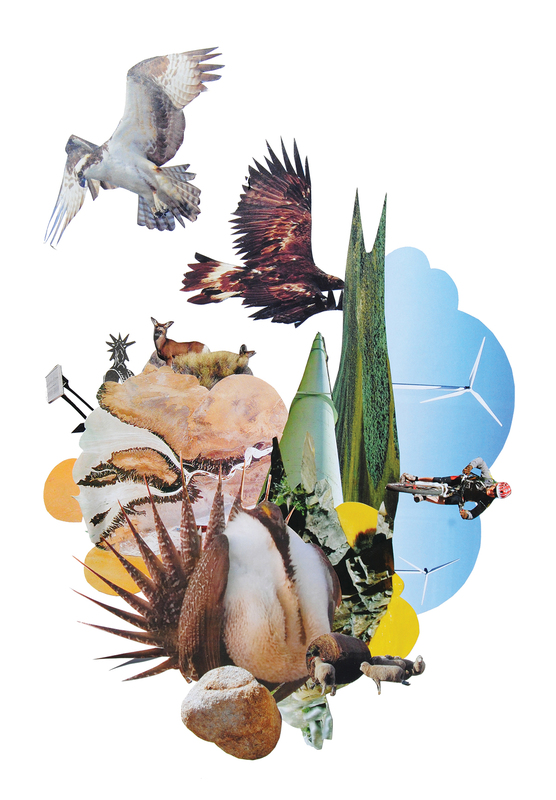 The county’s comprehensive plan identifies preservation of wildlife and habitat as a priority in land use decisions. But, Myers says, even if a developer had sought approval for a subdivision on the Fremont Lake parcel, the ultimate decision resides with the county commissioners. “I would like to think a zone change to a higher density wouldn’t have been approved, but I’ve thought that other times. I just make a recommendation,” Myers said. There’s another way the Fremont Lake property could have become home sites. Like other agricultural lands in Wyoming, it was eligible to be broken into ten, 35-acre ranchettes without invoking regulations and planning requirements by the county or consultation between Wyoming Game and Fish biologists and county planners, like Myers. That means that migration information is unlikely to bear on decisions about dispersed rural development even if a county’s comprehensive plan prioritizes wildlife habitat there. The ease with which a migration corridor can become a neighborhood means that conservationists compete with developers in the race to decide the fate of such properties. Luke Lynch, Wyoming State Director of The Conservation Fund, was a conservationist who thought like a realtor. He was aware of the Red Desert to Hoback migration assessment when the Fremont Lake property came up for sale. He knew the parcel was prime real estate for homes as well as deer. Sparing the Fremont Lake property from development, “fell right into the strike zone for the Conservation Fund. Luke latched on to that as priority number one,” said Mark Elsbree, the Conservation Fund’s Senior Vice-President for Conservation Acquisition. Lynch rallied partners to come up with the whopping purchase price. The Knobloch Family Foundation donated over half of the necessary funds. The Conservation Fund borrowed the remaining amount and purchased the land in April 2015. 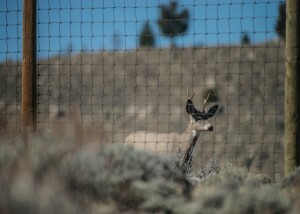 With help from the Wyoming Wildlife and Natural Resources Trust, the National Fish and Wildlife Foundation, and the Wyoming Game and Fish Department, Lynch pulled together another $400,000 to abate weeds, remove out-buildings, move the 60-year old elk fence, and convert buck-and-rail to wildlife-friendly fencing. Just after the land purchase was finalized, Lynch and a friend died in an avalanche while backcountry skiing in Grand Teton National Park. But the Conservation Fund has shepherded his vision to fruition. In summer 2016, the organization donated the land to the Wyoming Game and Fish Department, which named the property in Lynch’s honor. The Luke Lynch Wildlife Habitat Management Area is now safe from development. The Fremont Lake property is just one bottleneck in one migration corridor for one species in one state of the West. But it illustrates the potential to avert losses elsewhere. By understanding what prompts people to build homes in certain places and not others, sprawl becomes less random, and conservation decisions are likewise more quantifiable. Together with better data on where animals migrate and when, the opportunity to protect the right places grows. Nicole Korfanta is Associate Editor of Western Confluence magazine and Director of the Ruckelshaus Institute of Environment and Natural Resources at the University of Wyoming.